AEV’s ProCal Module for 2013-18 Ram 1500/2500/3500 trucks is a user-friendly recalibration tool that has a variety of unique features. One of the most popular features of the ProCal Module is its ability to correct the speedometer when larger tires (up to 48” tall) are installed. When the speedometer is left uncorrected, there is a major degradation in the performance of the stability control (ESP), transmission shifting, and engine performance – the ProCal Module will eliminate these issues by ensuring that the vehicle is properly calibrated. Please note: A visit to your local Ram Dealership and use of the WiTech diagnostic tool is required to complete this procedure. Although your TPMS screen will show the new values, it will not “take” and stop blinking until your dealership completes the process. The ProCal Module is equipped with a series of easy-to-use DIP switches. By reading the simple instructions included with the ProCal module, the user can quickly dial in a code for the desired recalibration. The entire process can be completed in mere minutes – once the switches are set, simply plug the ProCal Module into the vehicle’s OBD-II and wait for the horn to honk, confirming that the setting has taken effect. All 2018+ model year FCA vehicles have a new security feature that was implemented to prevent the OBD-II diagnostic port from being used for aftermarket recalibration tools and performance tuners. 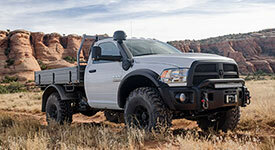 Therefore, the 2018+ Ram ProCal Module includes AEV’s Bypass Harness kit. This kit will bypass the new security feature, allowing the vehicle to be properly recalibrated by the end user. 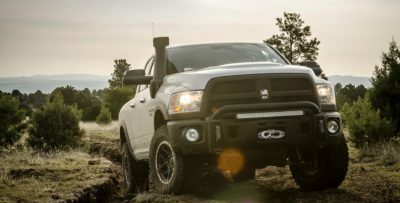 This Pro Cal Module WILL NOT work on 2019 Ram 1500 models.